Downtown Los Angeles, high noon. Three men in suits walk out of a bank into broad daylight, brisk and all business, indistinguishable from the cubicle drones clogging the sidewalk. They make a beeline toward a waiting car, the end of their workday in sight. They have just committed a robbery. But as the last of the group reaches the curb, he spots armed police officers across the street, waiting to pounce. Without hesitation, he raises his assault rifle and opens fire: a relentless volley that shreds the banal day. The report is thunderous, echoing down the canyons of the city, and the reply from the policemen’s guns is no less ferocious. The epic battle of Los Angeles in Michael Mann’s Heat has begun. Released in 1995, the movie remains the apotheosis of the director’s style—a muscular, outsized vision of laconic men at work. It is proudly old-fashioned and unabashedly movie-ish in its predilection for moments of pop cool and baroque grandstanding, most conspicuously in Al Pacino’s performance, the rare instance of the cop being more flamboyant than the robber. Heat‘s very scale announced its ambitions—the nearly three-hour film aspired to be the mother of all cop dramas. That made the gunfight at its center the mother of all shoot-’em-ups. Pauline Kael once wrote that “kiss kiss bang bang,” a phrase she saw on an Italian movie poster, was the “briefest statement imaginable of the basic appeal of movies.” Mann’s films reveal a director who understands that basic appeal and wants to sanctify it. He does so by pushing in two directions at once, imbuing his movies with brooding, operatic grandeur, even as he pays due respect to verisimilitude. The result is a gunfight aesthetic that’s both inflated and yet bound by the physical. Anchoring that sensibility is the sound of gunfire—masculine, thunderous, consequential—that seems both authentic and hyperreal, plucked from movie heaven. Though it takes place in the recognizable world—that downtown stretch looks unnervingly like one many of us walk everyday—the gunfight in Heat is pure movie: unhinged, excessive. Dozens of police cars, scores of officers, and hundreds of bullets are expended in a scene that serves as the climactic eruption of violence for a methodical and tightly wound crew of bank robbers. Mann creates nothing less than a war zone in the middle of L.A.—in the screenplay, the moment reads, “World War III ERUPTS”—and the effect is thrilling. God knows his kiss kiss needs work, but Michael Mann’s bang bang is as good as it gets. 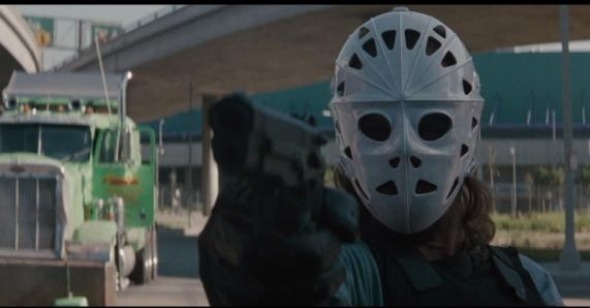 Mann has little use for the John Woo-esque flourishes of contemporary action movies or the “Look ma, no hands” curlicues of the De Palma set piece. No one defies the laws of physics in his movies, jumps in midair with both barrels blazing, or utters a lame catchphrase before firing away. Moments of iconic cool, when they happen, transpire organically, rather than feel like highlights around which set pieces were built. But that respect for the reality of the moment doesn’t preclude metaphor. The roar of the Mann firearm is the figurative made visceral. It is louder and heavier than the normal movie gunshot, sounding closer to cannon than firearm, each pull of the trigger a detonation that makes you flinch. Has any film sound defined its creator and his sensibility as succinctly as the gunshot in a Michael Mann picture? The truest form of expression for taciturn men of violence, it is also one trademark by which we identify the director’s movies. Less sound effect than statement, the report of guns in Heat is, like the rest of Mann’s picture, deadly serious. Gunplay it is not: this is the sound of gunfire meant to hurt, to kill. And yet it doesn’t smack of Hollywood special effects overkill, loudness for the sake of it. Like, presumably, most of the audience, I’m hardly an expert on guns, but the sound rings true—there’s a substance to it that, at maximum volume, can make you recoil. A cult among gun geeks has built up around Heat, which firearm aficionados see as being uniquely serious among Hollywood pictures with its handling of guns. According to one website, footage of Val Kilmer reloading his weapon has been shown to Special Forces trainees as a model for how to reload. Beyond its authenticity, the bruising boom feels definitive, taking us beyond the disposable sounds of mayhem in other movies. It’s rare that we associate a director with a particular sound. When we do, it’s usually for its expressionistic use: the haunting seaside winds of Fellini, the overlapping conversations in Altman, that low rumble on which David Lynch’s movies are built. What’s unusual about Mann is how memorable the soundscapes are considering their mundanity. What, after all, is more common in movies than the sound of gunfire? But in Mann’s cinema, they don’t sound just like any old gunshots. He has appropriated the most prosaic of movie elements and made it into his signature. I first noticed the sound of Mann’s gunfire in Heat, and it has been no less noticeable in his other movies. The shots in Miami Vice and Public Enemies are unmistakably his—loud, abrasive bangs that accompany gorgeous tongues of fire from barrels ablaze. The sound seems almost sculpted, lapidary aural figures that bear testimony to Mann’s notorious perfectionism. For some, the obsessiveness lavished over cops and robbers may well suggest the limits of Mann’s art. David Thomson clucked at Mann’s fixations and called him “the best kid filmmaker in the world.” The second part of Kael’s “kiss kiss bang bang” note laments that the appeal of the disreputable is “ultimately what makes us despair when we begin to understand how seldom movies are more than this.” It’s a criticism that could also apply to Mann’s canon, which at its worst suffers from flimsy psychologizing, unearned brooding, and a weakness for bathos. But the thunderous gunfire always snaps you back to attention. “I don’t know how to do anything else,” Pacino’s Vincent Hanna tells his quarry at one point. Neither does Mann, for better and worse. Kael notwithstanding, the base pleasures of movies, in the hands of a professional, remain profound. Mann’s sweating over the smallest detail—even the volume and depth of an assault rifle’s report—affirms his reverence for the promise of movies as a popular art.